Today we’re adding endocannabinoid health to your list of must-know wellness terms. Why? Because your endocannabinoid system is your body’s largest neurotransmitter, delivering important messages to other systems, cells, tissues, and organs—keeping them all in balance. The system is comprised of receptors found throughout your organs and glands (more on that below! ), and they’re doing their important job of neurotransmitting messages throughout your body (even right now as you’re reading this article) to keep you feeling good. We wanted to know more about harnessing their potential, so we reached out to the experts at Emerald Health Bioceuticals to get the lowdown. Your endocannabinoid system (also known as ECS) is your body’s largest neurotransmitter, and was was discovered in the 1980s by Dr. Raphael Mechoulam, a professor of medical chemistry at Hebrew University. The system is made up of cannabinoid receptors— found in vital organs and glands, like the brain, skin, stomach, lungs, and heart. These receptors are CB1 (found in your central nervous system) and CB2 (housed in your gut, immune cells, and peripheral nervous system), and they’re known for affecting everything from your central nervous system and sleep patterns to immunity and memory. If all the scientific terms are hard to remember, think of the ECS as your body’s natural alarm system. It’s always on alert, monitoring and noticing if anything’s off (like a poor night’s sleep or sluggish digestion), then sends out signals to make adjustments. The body’s goal is to keep you in a state of balance, or homeostasis. But, as we all know, modern life can take its toll. Everything from daily stress, poor diet, lack of exercise, and more, can deplete our ECS. The body creates two main endocannabinoids naturally: anandamide (or AEA) and arachidonylglycerol or (2-AG.) The names don’t exactly roll off the tongue, but these compounds are important because they serve as neurotransmitters that activate your cannabinoid receptors. So help your body out with these easy ways to keep your endocannabinoid system running in tip-top shape. There are lots of wholesome ingredients to enjoy that help support your ECS. Here are a few of them! Dark leafy greens: The beta-caryophyllene in dark leafy greens may help activate the CB2 endocannabinoid receptor, so load up on kale, spinach, and chard. Omega-3 fatty acids: Omega-3 fatty acids are basically besties with your ECS. Coldwater fish like salmon, sardines, and mackerel make great diet additions and fuel your ECS at the same time. If you’re vegetarian, opt for hemp seeds or hemp seed oil to get your daily dose. Herbs and spices: Black pepper, oregano, basil, rosemary, and sage all have natural cannabinoids. No big surprise here, but daily movement makes a big difference. Whether you choose walking, swimming, yoga, or something else, get moving! Need to rev up your body’s endocannabinoids? Schedule a relaxing massage. Osteopathic manipulation (known as OMT) refers to therapies that work the muscles and joints through pressure, resistance, and stretching. These types of massages are particularly effective for giving your ECS a boost. Yes, it’s quite alright to enjoy a glass of wine now and then, but excess alcohol can make it hard for your ECS receptors to stay strong, inhibiting and even deadening the signals you need. This herb contains natural stores of phytocannabinoids (the type of cannabinoids that plants produce) and may help support your immune system. You’ve likely heard about CBD, but did you know there are other compounds found in nature that activate your ECS? With the help of a scientific advisory board, scientists at Emerald Health Bioceuticals developed a four-prong approach to activating the endocannabinoid system using the first non-cannabis blend of herbs and botanicals.. It started by delving into the meta-analysis of more than 4,000 studies on specific herbs and botanicals that activate the CB1 and CB2 receptors in the same way that cannabis (THC and CBD) do. “The result is our science-backed proprietary PhytoCann® Complex, which is the foundation of all of our products. We use a combination of six herbs and botanicals (clove oil, black pepper, ginger, echinacea, peony, and magnolia) to activate the ECS in four comprehensive ways versus CBD alone,” Jade said. Ready to start feeling more balanced? 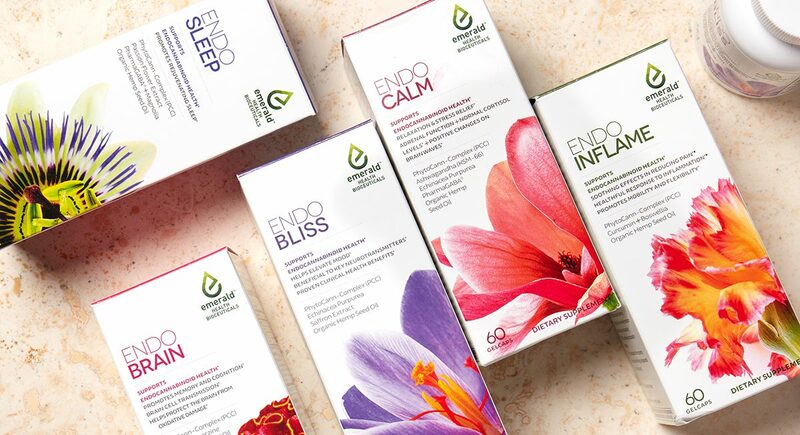 Rest assured that there won’t be any psychoactive responses with Emerald Health’s product line because the formulas don’t include any cannabis or THC (the psychoactive element of the cannabis plant). Pick your formula based on your specific concerns, and for best results, take a daily dose for a full 30-days. “We’ve heard stories of people getting results on the first day, but it depends on how healthy their endocannabinoid system was prior to activating it,” Jade said. When your endocannabinoid system is balanced, you’re more likely to enjoy restful and rejuvenating sleep. * Sweet dreams!